In the second installment of our coverage of the iGlobal Distressed Investing Summit (first installment here: Notes from February 2012 Distressed Debt Conference) we are going to focus on the Leveraged Loan panel. That will be followed by a comparison to the risk management panel in our next installment. These two panels presented back-to-back and held starkly contrasting view of where the markets are headed. As would be expected the Leveraged Loan panel had a fairly bullish outlook for performance for the asset class as well as the broader market, the risk management panel highlighted some of the serious headwinds that need to be overcome. Comments for the leveraged loan panel were off the record so no panelists will be given individual attribution. The Leveraged Loan panel pointed out that market has made big strides since the 2008-09 trough including a reduction in the maturity wall between 2012-2014 of approximately $587bn. Moreover, a significant portion of the highly leveraged 2007 LBO cohort has been able to Amend and Extend at attractive rates. On the new issue front leverage for most large cap LBOs has ticked down to more reasonable levels than the 6x+ that were seen in the boom. 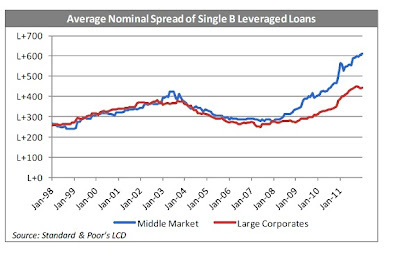 In particular, on the middle market front leverage is quite modest at 2-3x for senior leverage and 4-4.5x all in. In the panels opinion, the market has begun to price risk based on individual credit specific basis as opposed to correlating all leveraged credit instruments. Several of the recent larger bankruptcy filings such as Kodak and Hostess are the result of crushing OPEB obligations as opposed to lack of credit or. Moreover, in looking at the universe of stressed and distressed HY/LL one would see that on a dollar basis they are concentrated in few large LBOs such as TXU, CCU, FDC and the publishing space (directories, book stores). While this is true on a dollar basis, as a proportion of deals outstanding basis there is large number of issuers who cannot refinance. This is more pronounced in the middle and lower middle market, where credit has yet to open up to the same extent as the larger on-the-run market. An interesting phenomenon currently taking place are European issuers coming to the US markets given the lack of access to capital in their home markets. These are large cap HY/LL issuers who previously did not need to access the US$ HY markets. Those who are familiar with the European markets, particularly in loans, will appreciate that issuers wanting to raise funds in the US credit markets are doing so on US terms including doing away with terms that discourage trading of the securities such as borrower consent and high minimum assignments. New issues are required to provide deemed consent (allowing assignment to another lender without the borrowers consent) as well as $1mm minimum assignments as opposed to $5-10mm minimums in the European markets. Additionally, lenders are also demanding European borrowers to comply with US reporting standards such as filing of quarterly financials and providing MD&A. The CLO market is also showing sings of life with JP Morgan estimating CLO issuance $20bn in 2012. The panelists suspected that would be on the low end as the market has been pricing deals at tight spreads with AAA trances recently pricing at L+150, allowing for significant arbitrage. Furthermore, CLO equity is generating 30-40% IRRs which should attract more deal flow given that the equity has been more difficult to place since the credit crisis. 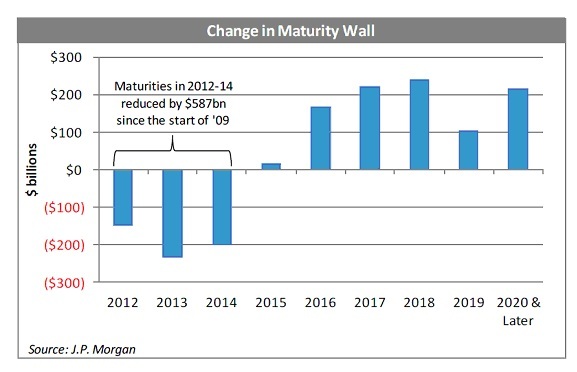 Nevertheless, this is a far cry from the days of 2006-07 when CLOs peaked around $150bn of annual issuance. There is also the issue that a majority of the CLOs are closing in or have reached the end of their reinvestment period. 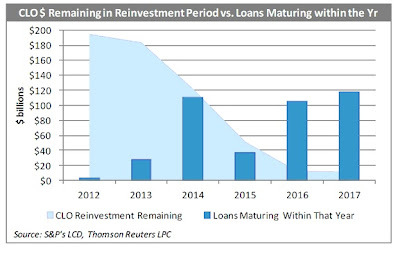 The fact that the CLOs could continue to redeploy capital towards refinancing and amend and extends has been a major factor supporting the credit markets these last two years. 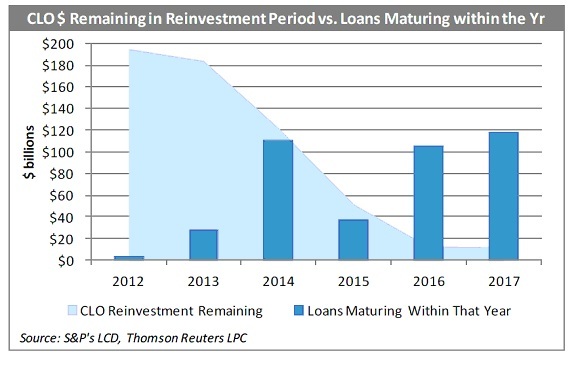 As the chart below demonstrates, this is ending as the reinvestment periods are ending just as the maturity wall begins to rise significantly. Finally with respect to the middle market it was pointed out that while institutional demand for middle market paper remains tepid, the Pro Rata market has been quite active. Spreads on BB Pro Rata vs TLB tranches are at 219bp, indicating a strong appetite fro banks to hold middle market loans. For those of you unfamiliar with leveraged loan terminology the pro rata tranche, or TLA, is the tranche held by banks and includes a pro rata share of the revolver and the TL. These loans are generally held by traditional banks while the TLB or institutional tranche is held by asset managers and hedge funds. The wide spread on pari-passu debt indicates a combination of an unwillingness of institutional investors to be exposed to the middle market and banks actively beginning to put money to work again. 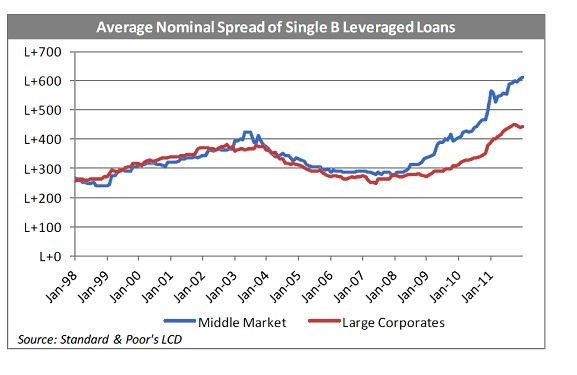 For lower middle market borrowers cash flow loans are more difficult, however the ABL market is open for up to 2-3 turns of leverage.